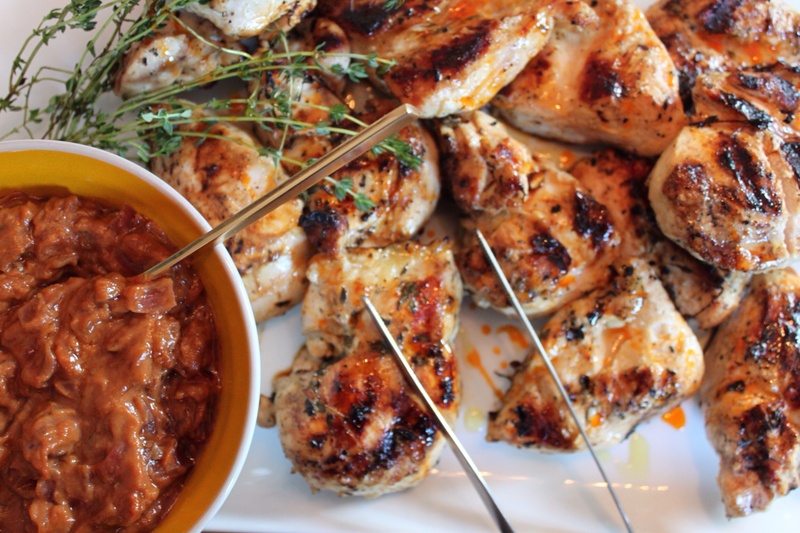 Ina’s Grilled Lemon Chicken with Satay Sauce is one of my favorite Spring to Summer recipes. I once made it for a (literal) boat load of water skiers on Smith Mountain Lake and I’m confident that I’ve never seen food disappear so quickly. There is something about the tangy lemon chicken with sweet and savory peanut sauce. It’s just different enough to make folks wonder what exactly is in it. Put this on your standby list. It’s a winner, as most Ina recipes are. Heat a charcoal grill. Grill the chicken breasts for 10 minutes on each side, until just cooked through. Cook the olive oil, sesame oil, red onion, garlic, ginger root, and red pepper flakes in a small, heavy-bottomed pot on medium heat until the onion is transparent, 10 to 15 minutes. Whisk in the vinegar, brown sugar, soy sauce, peanut butter, ketchup, sherry, and lime juice; cook for 1 more minute. Cool and use as a dip for Grilled Lemon Chicken.